If you follow me on Instagram, it's no secret that I'm a cat lady. I have two adorable fur kids who love to "help" me with my sewing projects. I know I'm not alone here, because I see similar photos pop up in my feed on a regular basis. I guess quilting and cats go hand in hand...or paw in paw? I thought it would be fun to spread the kitty love by hosting a swap...a kitty swap! No, not your actual cats. I'm sure they love playing in boxes, but I doubt they'd tolerate being shipped across the country. It's a kitty mini quilt swap! There are so many cute, modern fabrics out featuring cats, and I'm always seeing new quilt blocks featuring kitty shapes. Who wouldn't want to hang a quilty kitty up on their wall? Besides the dog people. In addition to a mini, I thought it would be nice if our beloved pets could get in on the fun. My cats love playing with softies and other handmade toys, so why not include some goodies for our fluffy friends? The questionnaire you'll fill out has a section to tell us about your cats (if you have any) and what they like, so your partner can include something to amuse them. Mini quilts should be MODERN. No batiks, traditional prints, etc. Quilts should either be made with fabric that features cat or blocks that form kitty shapes. Keep your partner secret! Post as many photos of your projects as you like, just don’t reveal who your partner is. We want them to be surprised! 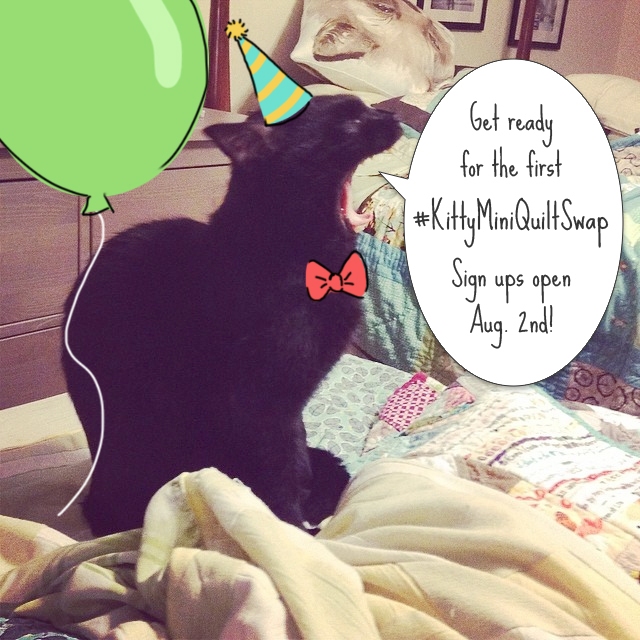 Use the hashtag #KittyMiniQuiltSwap when sharing photos on Instagram. And do share those photos, because the anticipation is half the fun! Answer the questionnaire carefully and thoughtfully. Your partner will be using this info to make you a mini you will love! Read your partner’s questionnaire response and make a sincere effort to make them something they would like. Mail your package in no sooner than October 1st, but no later than October 14th. If you miss the deadline, you will not be allowed to participate in future swaps until you’ve been a successful swap angel in at least one swap. If something comes up and you know you can’t make the deadline, email your moderator ASAP so we can find a solution. Try to include at least a few extra goodies, even if they’re from the dollar store. This swap is open to US residents only and will be limited to 60 swappers. This will be my first time hosting a swap and want to keep things small for this first round. If there is demand, I will do a second round with more slots and open it to international swappers. If you are not a US resident and you sign up, your response will be deleted. So don't do that. I've set up a Pinterest board with inspiration for fabric choices, quilt blocks, and extra DIY goodies. Follow Felice's board Kitty Mini Quilt Swap on Pinterest. If these rules work for you, head to the questionnaire to sign up! Please note that the questionnaire will not begin accepting responses until Aug. 2nd at 8:00 AM central time. It will also no longer accept responses once we have 60 swappers. If you don't get in, don't worry, because I'll host another round if there is demand. My goal is to have swap partners assigned by Aug. 11th, so remember to check your email! Somehow my form got submitted before I finished :( I think I hit the big stuff. Let me know if you have any further questions. I see! I've sent you an email with the remaining questions. If you were able to fill out the questionnaire and submit it, you got in. :) The questionnaire didn't even show up after 60 spots were filled. Missed the sign up notice! REALLY hoping there will be another swap! Don't worry, I'm 90% sure I'll be hosting another round since this one is so small. It will probably be after the holidays. How did I miss this? HOW HOW HOW!!! Loving all the photos on instagram! !